Friday September 9th 1892 After I got some work done about the house this morning I wrote a letter to Vene. I worked on my lace after dinner till about four oclock. Mother and I went over to Halsons for a call. We got supper over and I read all the evening. Saturday September 10th 1892 I walked to town and back this morning and got back just in time to escape a heavy shower. It rained the rest of the day. I was down at Hatties and called at Esthers too. I worked on lace in the afternoon and evening. I had a letter from Mr Able. His father has died very lately. 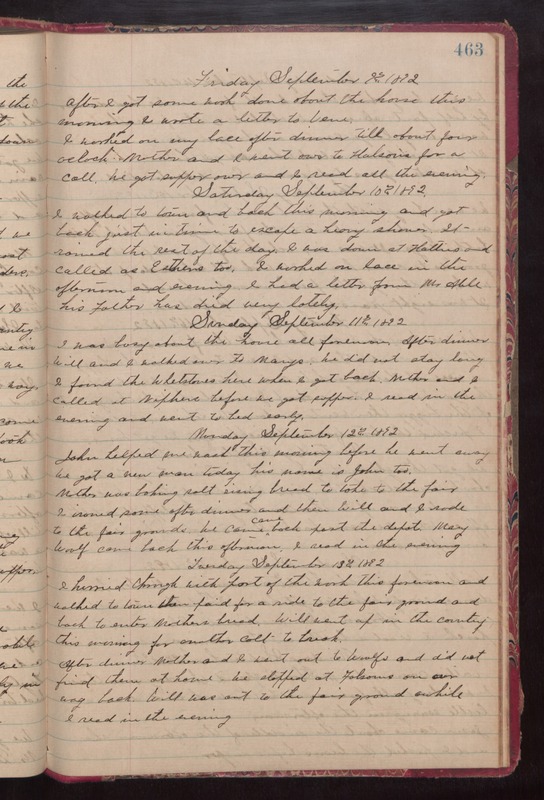 Sunday September 11th 1892 I was busy about the house all forenoon. After dinner Will and I walked over to Marys. We did not stay long. I found the Whetstones here when I got back. Mother and I called at Niphers before we got supper. I read in the evening and went to bed early. Monday September 12th 1892 John helped me wash this morning before he went away. We got a new man today his name is John too. Mother was baking salt rising bread to take to the fair I ironed some after dinner and then Will and I rode to the fair grounds. We came back past the depot. Mary Woolf came back this afternoon. I read in the evening. Tuesday September 13th 1892 I hurried through with part of the work this forenoon and walked to town then paid for a ride to the fair ground and back to enter Mothers bread. Will went up in the country this morning for another Colt to break. After dinner Mother and I went out to Woolfs and did not find them at home. We stopped at Folsoms in our way back. Will was out to the fair ground awhile. I read in the evening.